There’s no quick answer. What we refer to simply as “taste” is really an intricate phenomenon involving multiple mechanisms in the mouth and brain. Scientists have discovered that our sensitivity to taste is in fact based on our DNA; some people actually do have the capacity to experience flavors more intensely than others. And a leading taste researcher at Yale University has demonstrated that for women, intensity of taste varies with hormonal cycles. All this complexity notwithstanding, research and experience also suggest that there are simple ways in which you can maximize the flavor of any wine you drink. Much of what we call “taste” is really smell. Research indicates that while many aromas are detected by nerve cells in the nose (and best absorbed by taking lots of quick sniffs while you’re drinking), some ― and here’s the surprising news ― are registered at the back of the throat. Conclusion: You need to hold the wine in your mouth for a few seconds and slosh it around a bit to get every smell (“taste”). The sensory organs we call taste buds are contained in onion-shaped structures all over your tongue and soft palate. And it takes time for flavor molecules to penetrate the opening in the top of these structures (which is why we tell children to swallow fast when they’re taking a bad-tasting medicine). The moral of the story? If you drink a wine in down-the-hatch fashion, you simply won’t get the full impact of its flavor. Again, you have to hold it in your mouth for several seconds (some evidence suggests up to four). Use large glasses with generously sized bowls to give you room to swirl vigorously ― which is the next point: Be sure to swirl every wine more than once. Aerating the wine helps release aromas (and hence flavors). A final corollary to this: Young, tannic reds like Cabernet Sauvignon and Merlot will always taste more profound if you pour them first into a carafe, pitcher, or decanter. Just the act of pouring the wine through the air makes a huge difference. Skeptical? Try conducting a simple experiment: Taste a wine, intentionally not following any of the suggestions above, then try the techniques. 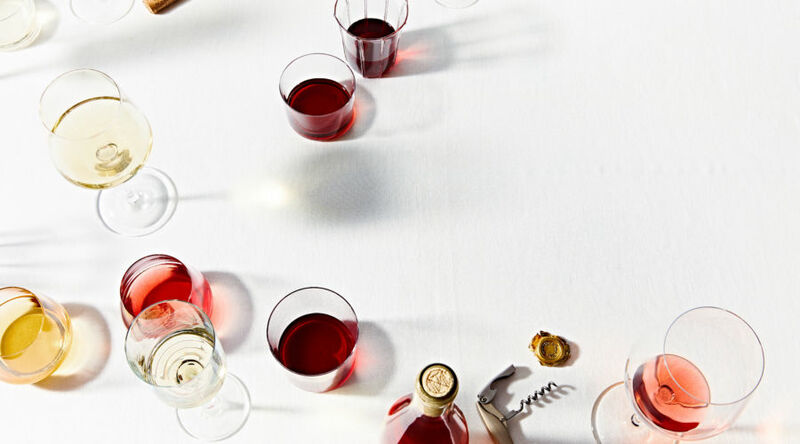 You’ll be amazed at how much more flavor every glass of wine can yield. Here are some terrific grape varieties on which to try the tasting advice above. Though each of these grapes is beginning to be grown on the West Coast, I’ve recommended a stellar wine from the grape’s ancestral home. PINOT GRIGIO (also known as Pinot Gris): This fresh, light, snappy wine can be found all across northern Italy. (Note that Pinot Gris from Alsace, France, is a weightier version.) Try Alois Lageder Pinot Grigio from Alto Adige; the 2000 costs about $15. VIOGNIER: Sensual, rich, wildly aromatic, floral, and perfumed, Viognier (pronounced vee-ohn-gnay) is an exotic grape. Its home is Condrieu in the Rhône Valley of France. Try E. Guigal Condrieu; the 2000 costs about $35. GRENACHE: Like a pot of homemade black cherry jam, Grenache is juicy and irresistible. The best in the world is grown in southern France, where it’s the dominant grape in Châteauneuf-du-Pape. Try Château La Nerthe; the 1998 costs about $37. MOURVEDRE: Dark, masculine, and brooding, Mourvèdre is a serious red wine. One of the world’s best examples is Domaine Tempier from the southern French town of Bandol; the 1999 Bandol Rouge costs about $30. SANGIOVESE: This is the great grape of Chianti, with flavors reminiscent of dried leaves, tea, even citrus. Sangiovese has a lot of acidity (unusual for red wine), making it terrific with food. Try Ruffino Riserva Ducale Chianti Classico Riserva; the 1997 tan label costs about $21. SYRAH: The most dramatic, meaty, spicy, licorice-flavored Syrahs in the world come from a tiny place in the northern Rhône Valley called Côte-Rôtie. The 1999 Chapoutier Côte-Rôtie Les Bécasses costs about $86.